2013 New Mexico/Arizona Book Awards WINNER for BEST HISTORICAL FICTION! Return of the Bones is a dazzling family epic of love and forgiveness. In 1915, 2,067 skeletons were stolen from the ghost pueblo of Pecos and transported to Harvard University for medical research...In present day and across the miles, the wind carries their cries to Grandfather, who hears the bones longing for home. But worlds collide when his modern granddaughter agrees to drive him across the country to bring home the bones of their Native American ancestors. Hollow-Woman and Grandfather are the last of the Pecos people, but she is not interested in ancient skeletons. She works at an Indian casino, while Grandfather is a shaman and values tradition. She hopes the road trip will heal their broken hearts. Grandfather fashions a magical dream catcher to help her "see" her ancestors' lives, and come to love the missing bones, as he does. While driving a ratty old pickup-camper, the cantankerous Grandfather and stubborn Hollow-Woman bicker from New Mexico to the Peabody Museum. A glowing literary work, with religious undertones of the persecution of Native Americans by the Catholic Church's Spanish Inquisition. Return of the Bones pulses with emotion. The narration by actress, Sarianna Gregg, is filled with the comical way Grandfather looks at the world while embracing the heartbreak and spirituality of the Native American peoples. You may know these famous bones on which landmark studies proved that exercise prevents osteoporosis! Did you know that President George W. Bush's grandfather, Prescott Bush, dug up Geronimo's grave and stole his skull for initiation into the Skull and Bones Society at Yale? Return of the Bones is enhanced with video and pictures through the book’s website http://magicprose.com . 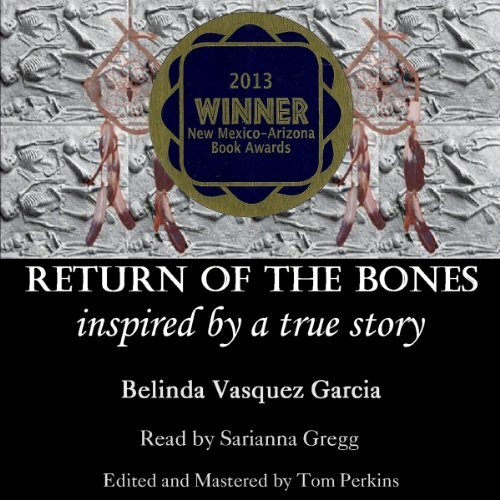 I wanted to listen to this book because it was based on the true story of the Pecos Pueblo – how the bones of their ancestors were removed in the 1920’s from their resting place in New Mexico and shipped off to Harvard for study. The beginning started out slowly for me, but I understand that the author needed to lay the foundation with the necessary history. Thankfully, Belinda Vasquez Garcia didn’t get on her soapbox and denounce the evils of our country’s early beginnings by the Spanish and early American settlers. Rather, the story centers on Hollow-Woman and Grandfather who are the last of their tribe and who travel cross country to retrieve the bones of their ancestors. Grandfather shares with his granddaughter where the bones came from and what they mean to their tribe and descendents. Needless to say, Hollow-Woman is disgruntled at first and reluctant to go on this road trip with the old man. Sarianna Gregg’s narration accurately depicted Hollow-Woman’s transformation during the road trip from a modern non-believer to proud Pecos descendent. She also demonstrated the comical way Grandfather looks at the world while embracing the spirituality of the Native American peoples. Only if the friend is really interested in historical events in the U.S.
Would you be willing to try another book from Belinda Vasquez Garcia? Why or why not? Yes. I think she covered the history in a masterful way. What three words best describe Sarianna Gregg’s performance? Patchy. Hollow Woman's accent seemed to change a little. I wasn't sure what it was supposed to me. Was Return of the Bones worth the listening time? The best part of this book was the history. It was really interesting to the learn about the Pecos people and the pueblos because I had never heard this story before and I think it's important to know. However, I didn't find the present day characters compelling. The relationship between the Grandfather and Hollow Woman was dynamic over the length of the book but I couldn't get into it. It just seemed a bit shallow. This may have been because of the format of the book and the paranormal aspects. I couldn't reconcile the paranormal with the present day aspect of the book. I think that it may have been the way Hollow Woman didn't believe and was scornful of grandfather's magic and there was no early evidence about the truth in grandfather's magic. I just didn't find it believable. The flitting between the past in the trace-states made it difficult to keep track of what was going on in an audiobook. The audiobook format may not have been the best for this book. Simply because it moved a little slowly and there were inconsistencies in the voicing of Hollow Woman in terms of accent.In the end, while I liked the idea of this book and the history was great to learn, the fictional novel aspect of the story was lacking and was sometimes slow. Some interested in listening to people rant about ancient atrocities. Would you be willing to try another one of Sarianna Gregg’s performances? The feeling that I (or anyone else) could have written it better. Annoyance with the plot. Contrived plot. If grandfather was so old, how old was he when he fathered the girl's mother? If he was so old and frail, why take him anywhere? He is a total pain, and he won't shut up.